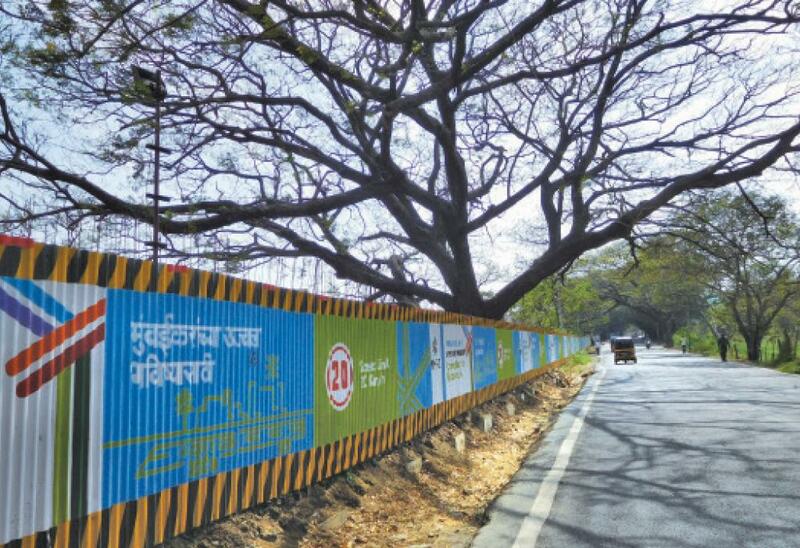 Over 40,000 suggestions and objections were submitted by citizens and activists in mid-October against the Brihanmumbai Municipal Corporation’s (BMC) proposal to cut 2,702 trees in the Aarey Milk Colony in Goregaon for the Metro-3 car shed project. BMC put out the notice on behalf of the Mumbai Metro Rail Corporation (MMRC)—which will construct the shed—on September 26. Aarey was once a part of the deciduous stretch of forests, now restricted to the adjacent Sanjay Gandhi National Park and hillocks. With the coming of the Aarey Dairy Co-operative, the thickness of the forests was broken up to create open ecosystems of grasslands, scrubs, marshes and water bodies, giving refuge to an interesting assemblage of species. The large open para grass fields are feeding grounds of Munias, Drongos and Egrets, which have been proposed for the car shed. The drains that nurture these grass pastures are home to native fish species, crabs, shrimps and Checkered Keelback water snakes that are protected under the Wildlife Protection Act, 1972 by virtue of being Schedule II species. In the first week of October 2018, non-profit Vanashakti claimed in the Bombay High Court (HC) that 2,076 hectares of Aarey Colony were transferred to the state’s forest department in 1969. Thus, all development activities that have an adverse environmental impact on the area must be stopped. But Vanashakti says that the records have gone missing. The state has been asked to respond. The petition in HC came after the National Green Tribunal (NGT) expressed its inability to address the Aarey issue—interestingly, not being a forest—on grounds of jurisdiction. Concurrently, HC refused to pass an interim order staying the cutting of trees pending the hearing of the plea. This, along with the lifting of an interim order preventing construction at the site, has cleared the passage for the car shed project. "We will not cut any tree without taking prior permission from the authorities concerned,” maintained MMRC to HC, reiterating its stand of adhering to “due process”. The deposition followed another similar writ petition filed by Aam Aadmi Party’s (AAP) Preeti Menon and Ruben Mascarenhas on October 1. In June 2015, Vanashakti and the Aarey Conservation Group, another citizens’ association, had filed a petition with NGT’s western bench in Pune against MMRC seeking that Aarey be designated as a forest and the 33-hectare car shed should be shifted elsewhere. Three years later, on September 20, they withdrew the petition from NGT after being told that the case would be dismissed as “only a High or Supreme Court could give them relief”. Concurrently, the tribunal also lifted an interim order staying debris dumping, tree felling and land reclamation at Aarey thereby permitting all construction activity. Vanashakti director Stalin Dayanand alleges that MMRC has even lied in their affidavit to HC that they will only cut 250 trees when now they wish to cut 2,702. “The Tree Authority will never give them permission. The shed will be needed only after the entire Metro construction is over. This is a ruse to open up more space for developers,” he insists. Environmentalists, activists and many locals aren’t ready to give up without a fight. “We are not against development as is wrongly being attributed due to our protests,” says Mascarenhas. The HC bench of acting Chief Justice Naresh Patil and Justice G S Kulkarni has directed BMC to address complaints of those opposing the construction of the car shed. The bench also directed BMC authority to publish the data of permission granted for cutting trees and the map coordinates of the trees. MMRC has also filed an affidavit in court claiming they have not removed any of the trees from the proposed project without the permission of BMC’s Tree Authority. On its part, BMC argued it was premature since its Tree Authority was yet to grant final permission for cutting trees vindicating the very premise of protestors. Allegations of failure to follow “due process” could be examined only after this Tree Authority grants or refuses permission. The bonafides of its decision could not be examined “before” the decision is taken. In the first citizen hearing on October 10, around 200 residents turned up for the public hearing, and a section of activists maintain the “civic body and MMRC officials simply left in the middle of the deliberations, without resolving even a single issue”. The authorities have maintained that a second public meeting to give a hearing to everyone is on the anvil. Once the Metro car shed is completed, the result will be an extensive alteration of the existing landscape and the creation of a zoo and a flyover. Maybe this is the most opportune moment for Mumbaikars to come together and fight for whatever little is left of the last surviving green belt in the metropolis. What Chipko movement we are talking here, let's evaluate few facts here before we get to the point. and don't understand the value of human life, or are made to understand, whereas directly there’s no animal/bird being killed by taking only 2.5% lands from vast Aarey and at the same time planting more than 25000 trees of native variety. It's sad to know that no one, among these concerned citizens, is worried about the loss of 10 innocent lives per day and trying to block the development activity which will not kill any animal/bird but give respite from traffic woes, reduce traffic, reduce pollution and bring comfort to the daily commuters. Such is the damage this opposition, to acquire land for car depot, that every single day delay caused to the metro project making us tax payer to lose 5 Crore everyday, the worse part is that everyday we are directly responsible for killing of 10 innocents lives of open track of Mumbai local. When will we understand the clear difference in indulging in politics or caring about the society. There are multiple studies in the west where similar potion of lands were taken for much needed industrial development and by planting more number of trees it was found that the ecological balance was well maintained. Technically, all metro lines to be fed train to the main line from either end, in case of metro line -3 the feasibility study was carried out by highly qualified experts and it took almost 4 years to finalize this alignment, the project was not planned overnight. May the better sense prevail!